Das neue Selbstverständnis der Berliner Republik. Who are the Germans now? It is, in essence, this question which Frank Brunssen addresses in his very readable and lively book on the issue of German identity. Whereby it needs to be stressed at the outset that identity is a word Brunssen would prefer to avoid; instead, he suggests ‘Selbstverständnis’, a term which can only very imperfectly be translated as ‘self-understanding’. Brunssen’s dislike of the term ‘Identität’ is well-argued. He provides a brief overview of the search since the 19th century for a homogenous German national identity, a search which resulted, according to Brunssen, more in disharmony and exclusion than in an all-embracing sense of unity. Bismarck’s campaign against the Centre Party and the Catholic Church, as well as that against social democracy, demonstrates how notions of oneness and sameness were bound up with discrimination. Under Hitler, as Brunssen argues, the much-vaunted ‘Volksgemeinschaft’ was based not so much on positive, as on negative criteria; the exclusion of those who did not belong to this community, such as Jews and Sinti and Roma, determined its boundaries. In the German Democratic Republic, a ‘national’ identity was sought through the problematic medium of identification with antifascism, while in the West, constitutional patriotism attempted to fill the breach left behind by the division of Germany. In 1989 and 1990, the period on which Brunssen largely focuses, the chance for a more inclusive and non-discriminatory sense of Germanness arose. Not German identity – but self-understanding. Brunssen’s opposition to the term ‘Identität’ thus stems from a historical sense of its association with attempts to herd Germans nolens volens into a stifling homogeneity. By contrast, ‘Selbstverständnis’ suggests, firstly, a voluntary articulation; secondly, it suggests plurality. For while there can only be one ‘Identität’, if we follow Brunssen, there can be a variety of ‘Selbstverständnisse’. Brunssen’s model thus allows for an East German self-understanding, as well as a West German one; and it allows for regional self-understandings. Above all, however, Brunssen rejects the search for German identity because he sees it as anachronistic. As the European Union deepens and expands, so Germans and other nations come to think of themselves as citizens in a European federation; the question of what it means to be German is at the least, then, secondary to the issue of what it means to be a European. For Brunssen, then, ‘identity’ is out. Yet for all the power and clarity with which he advances his thesis, it is self-contradictory. For in prescribing a notion of self-understanding rooted in mutually acceptable heterogeneity, Brunssen appears to deny to the Germans the right to seek a more widely-based sense of unity. One might ask, moreover, if the difference between ‘Identität’ and ‘Selbstverständnis’ is not purely one of perspective. There is no semantic reason to attribute to ‘Identität’ a negative character, or for that matter a positive one to ‘Selbstverständnis’. What Brunssen is really doing, it seems to me, is proposing a denationalisation of the German sense of self. He points not just to European federalism, but also to multiculturalism in Germany as well as to fundamental differences between east and west Germans as factors generating an increasingly disparate set of ‘self-understandings’ which should not be devalued by insisting on national norms of identification. While I would wholeheartedly concur with the need to avoid imposing national norms, I would not suggest, as Brunssen seems to me to do, that the search for them is per se to be rejected. It can be problematic, as the whole Leitkulturdebatte demonstrated. But it remains a vital and necessary part of nation-building, a process Brunssen admits is still very much a feature of contemporary Germany. Brunssen himself in any case comes close to suggesting that contemporary Germany does have a national self-understanding, based on the ‘Grundgesetz’ or at least on a ‘demokratischer Grundkonsens’ (p. 132). Elsewhere he appears to remain sceptical of national models of identification. Indeed one of the points he rightly makes earlier in the book is that the failure to bring about unification via Article 146 effectively excluded East Germans from a defining role in the development of a new constitution – a failure only partly mitigated by subsequent amendments to the ‘Grundgesetz’. But in a way it is perhaps inevitable that Brunssen should emphasise the role of the Basic Law, given that it does, to a considerable extent, guarantee precisely those pluralist values upon which heterogeneity depends. Yet what of the changes to the paragraphs governing asylum? What of the attempts by the CDU to hijack left-liberal ‘Verfassungspatriotismus’ and reinterpret the Basic Law as a kind of holy bible of western values upon which all immigrants, not least Muslims, should swear a solemn oath? For all that I would take issue with Brunssen’s thesis, his book has much to recommend it. It is beautifully and meticulously written. It is a book about self-understanding which wants to make itself understood, and it does just that. It provides one of the most interesting accounts of the 1989/90 period that I have ever read. In four longish chapters on ‘Die Revolution in der DDR’, ‘Die Verwirklichung der deutschen Einheit’, ‘Das Projekt der inneren Einheit’ and ‘Das historische Selbstverständnis der Berliner Republik’, Brunssen manages to keep a sense of proportion. He understands both East and West German positions on this period very well. Perhaps he might have explained at more length why he decided to dedicate so much of his book to the 1989/1990 period – after all, the Berlin Republic in the title of Brunssen’s book may have begun in 1990/91 (unless you subscribe to the view that it did not begin until the government moved there in 1999), but surely its development in the 1990-2000 period would have deserved closer attention. I presume the reason for the focus on 1989/90 lies in Brunssen’s wish to trace the genesis of an East German sense of self-understanding in that period. But it would have been interesting to see how this sense developed. Brunssen does explore issues of ‘Ostidentität’ and ‘Trotzidentität’ as they were expressed in the course of the 1990s, yet too briefly, I feel. Students in Britain and America will find Brunssen’s book on German identity (or self-understanding) a valuable read. It is always informative and interesting in an accessible way. Whether scholars of post-unification Germany will find much that is new here, however, is debatable. The facts which Brunssen so articulately conveys are well-known, and over parts of the book he loses sight of his attempt to prove his thesis and focuses rather on telling the familiar story of German unification and its attendant problems – albeit very well. If the footnotes are anything to go by, Brunssen has relied for this story very much on memoirs or essays by leading lights such as Kohl, Schäuble, Teltschik and Schorlemmer. He might have cast the net for his research a little wider. His thesis, moreover, might have benefited from being more sharply delineated against notions of identity developed by other thinkers; surprisingly, there is no mention of Lutz Niethammer’s controversial book on identity. In his preface, Brunssen claims that he wishes to satisfy both an academic and a student audience. He will certainly satisfy the latter; less so the former. In the end, too, I do wonder if the author does not end up trapped on the horns of the dilemma he so acutely recognises. German national identity is a historically troubled being, riven by fractures, tensions and divisions. Attempts to overcome these fractures have indeed usually resulted in autocratic solutions which merely exacerbated the fractures. It seems only logical, perhaps, to suggest that the solution lies in abandoning the search for inner unity, and learning to reevaluate the fractures as fruitful expressions of pluralism. But that merely represents yet another vision of national identity – one in which pluralism, per se an utterly positive quality, can harden into a dogma. Should the Germans win the World Cup in 2006 with a victory, say, over the Italians, I would be more worried by a lack of celebration out of concern for the feelings of Germany’s Italian immigrants than by a show of national pride. Niethammer, Lutz, Kollektive Identität. Heimliche Quellen einer unheimlichen Konjunktur, Reinbek bei Hamburg 2000 (reviewed by Uffa Jensen: http://hsozkult.geschichte.hu-berlin.de/rezensionen/id=3959). 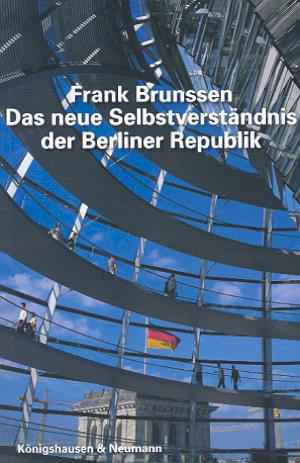 Bill Niven: Rezension zu: Brunssen, Frank: Das neue Selbstverständnis der Berliner Republik. Würzburg 2005 , in: H-Soz-Kult, 22.02.2006, <www.hsozkult.de/publicationreview/id/rezbuecher-6113>.